I started taking what the BBC refers to as purposeless walks this past winter as a strategy to avoid burn out and make space in my packed schedule. On these walks, purposeless is the purpose. Starting in early January, I’d wake up in the morning and do only the bare minimum needed to get myself out the door – throw clothes on over my PJs and fill a portable mug with coffee. On these walks, purposelessness is the purpose. When I head out the door, my legs decide the route, not any agenda. I give as little conscious thought as possible to the direction I turn and allow the moment to inspire me. That it is unplanned and unstructured is most beneficial. In not planning where I will go, I can let go mentally. I always leave my phone and wallet at home so that even if I’m tempted to run an errand, I can’t. In eliminating an agenda, I free my mind to wander with my feet. Sometimes my feet follow the sun and sometimes they follow a cute dog. 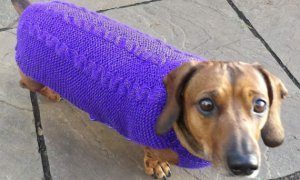 True story: One day, on my purposeless walk, I saw a dachshund on a purple-full walk. Note: I found this picture on the internet since I don’t bring a camera with me on my walks. On one walk in particular, my wandering mind lead me to the question of how I got here – living in NYC and teaching yoga. Mentally I retraced my steps and realized that my life progressed a bit like the walk that I was on – unplanned. Images of the faces of people, the essence of places, and past impressions of mindsets filled my memory. It was overwhelming because thinking about the past brings up a lot. And to go there and be with what comes up, requires space. Retracing my steps down memory lane, two major life intersections stood out in my travels. Retracing my steps down memory lane, two major life intersections stood out. My parents’ divorce made me turn sharply away from home. Their split was not surprising news. I had felt its immanency throughout my childhood. The significance it had in shaping my life, beyond the significance divorce has in shaping child development in general, lay more in its timing. I was 16, on the cusp of realizing adulthood, and about to jump out of a broken nest. It’s hard enough to leave the comfort and familiarity of home, but when home is no longer familiar, suddenly everywhere is new. It was around that time that I decided what I wanted to be ‘when I grew up.’ A few years later, I applied to acting school. My parents’ divorce made me turn sharply away from home. With some distance between myself then and myself now, I realize a large influence on my desire to become an actor was to help me cope with what I was going through and better understand myself. As an actor, embodying emotional turmoil through the buffer of the characters I played, I got the opportunity to feel, but indirectly. Looking back, I realize this fits very well into my patterns in adulthood. Anguish, loss, and grief are difficult emotions to face. Work is my go-to buffer. It shields me from the space that can sometimes unexpectedly reveal deep sadness. This is a group senior photo of the B.F.A. actors and musical theater artists I went to Ithaca College with. My life turned around and headed back toward familiar roots. 3-years-deep in the struggle of making it as an actor in New York City, I met Nathan, my now husband. It was during this time that my life took another sharp turn, and wandered back toward familiar roots. Nathan is from the Midwest, like me. I felt my heart go a-flutter when I listened to his first voicemail. My brother Andy had set us up and given him my number. He was calling me to invite me on our first (blind) date. His strong, endearing Upper Peninsula of Michigan accent (colloquially called a ‘Yooper’ accent) immediately caught my attention. A Yooper accent is like a Wisconsin accent times 100 and my heart recognized da sound of home. Luckily, his character was as endearing and as strong as his dialect. Winter storm Jonas gave me an unexpected weekend off with Nathan. 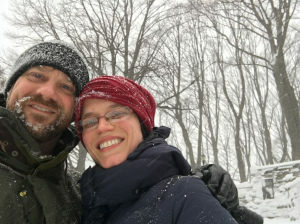 Here we are on a walk through Fort Tryon Park, the most beautiful park in Manhattan. My relationship with Nathan added steadiness and security to my unstable actor life. This security gave me space to consider my future more seriously and ask myself what I really wanted out of my acting career. Thinking ahead to a future with him, it inspired me to ask myself what I really wanted out of my life. One answer stood out more than the rest…I wanted desperately to quit waiting tables. This survival job was making me miserable. I felt stuck. Nathan helped me brainstorm other things I could do that would be flexible enough to accommodate auditioning and lucrative enough to pay rent. I settled on getting certified to teach immigrants and foreign visitors English. But in seeking to replace my side-job, I accidentally replaced my career. My first foray into teaching lead me quickly to realize that I loved it. Soon after, I started teaching yoga, which I had been practicing since acting school. In finding teaching, I had found my vocation. It’s a vocation with deep roots in my family ancestry. Through the generations, a great many of my relatives are teachers, including my mother, my father and my oldest brother, Matt. Nathan is a teacher, too. I avoided following in the steps of my family for a long time, but eventually, I fell right into their deep footprints. Nathan and I lived in Ecuador for a few months. 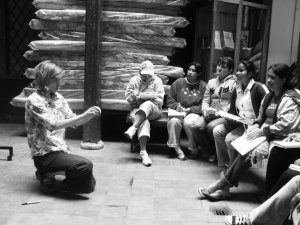 While he took Spanish lessons I visited a women’s prison and used my newly acquired teaching skills to teach the women English. I also lead a few yoga classes with them before I was certified to teach. I had gone very far away mentally on this purposeless walk when I realized I was approaching my building’s stoop. Like all my walks, I had no idea where it would take me. And in not knowing, I was able to stumble upon some unexpected clarity and perspective. The question “where do you want to be in 5, 10, or 20 years” has always completely mystified me. But I think I better understand the value in asking it after this walk. The question, I feel, is more of a reflective tool that really asks what you value now. And in asking yourself what you value now, another useful question to ask is, “what were the most pivotal turns I took to get here?” The directions you turned can reveal a lot about the compass that guides you. In 5, 10, 20 years, I hope that I am still dropping my agenda to take regular purposeless walks. Loved reading this Laurel. It was great working with you during those early years when you were taking your first steps in acting. You are great on stage but I imagine your Mom is somewhere smiling at your chosen profession. She was an excellent teacher and would undoubtedly be proud of all you have accomplished in your journey. Carla, Sand County Players Community Theatre is part of some of my best memories of all time. 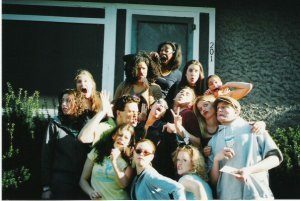 To collaborate with theatre artists in our tiny little town was such a big inspiration for me. I love that space – there is nothing like it – and all the fun I got to have in it making theatre. That’s a beautiful reflection of yourself. Thank you for sharing it. I love this idea and maybe I can find sometime for a purposeless walk in my life soon. You’re an inspiration!